Hard water does not rhyme with soap, shower gel, and shampoo. This makes it hectic to take a shower since it’s difficult to lather. As such, you end up using too much soap or shampoo and take too long to rinse it off. Even after a successful rinse, the hard water leaves your skin and hair feeling dry and it’s also said to cause itchy skin, eczema, and dandruff in some cases. If you don’t have a whole-house water softening system plumbed in already, getting one of the best water softener shower heads is another great way to go around this. These heads act like any other point-of-use water softening system by trapping the hard water components right before the water jets out. Below are a few that made this year`s cut. Let's dive in! The Aquabliss High Output shower filter works by thoroughly filtering and eliminating chemicals and minerals that make water hard and contaminated. The 12-stage filter eliminates large to small sediments, dust, and turpitudes, chlorine and metals, bacteria and algae, and organic materials and impurities. It does all this while boosting negative ions and oxygen levels, releasing revitalizing minerals for advanced and extensive filtration. In the end, you get soft, impeccably clean water with balanced PH levels, and neutralized odors. A great feature on this gorgeous chrome-finish unit, that was highlighted by our review team is the ceramic balls ability to repair damages on the hair, skin, and nails while infusing Vitamin C and other beneficial minerals. Unlike other water filters that substitute calcium sulfate, ceramic mineral balls and redox media with cheap activated carbon, Aquabliss balances the elements required to properly eliminate bacteria, pesticides, chlorine and heavy metals such as mercury, chromium, lead and nickel and other harmful chemicals that cause flaky dandruff, itchy skin, and brittle nails thus rejuvenating your skin. Additionally, the system inhibits the growth of lime scales, fungi, and molds hence promoting the lifespan of your shower head. It is impressive how easy the installation of this showerhead is. You can do the no-tools installation or filter replacement process within minutes. All you have to do is remove the old showerhead and snap the Aquabliss shower filter on, a highly practical and easy process for any homeowners out there. Actually, previous buyers say that it is as easy as fixing a light bulb. Another great feature is that it is a one-size-fits-all model that works with all shower types: fixed, handheld or rain showers. You also get a 100% satisfaction guarantee with a hassle-free refund upon any complaints. The easy swap shower head filter replacements (buy on Amazon) is very affordable and filters between 10,000 and 12,000 gallons of water. This top of the line showerhead has a sleek chrome finish and has been tested and independently certified by the NSF International to reduce up to 99% of chlorine from water. It comes with a 5-year limited warranty so you are assured of the quality of the product you are purchasing. This wall-mount shower head installs on any ½” threaded shower arm and offers a 2.0 GPM flow rate on a five spray setting designed to offer you an enjoyable and refreshing shower experience. It reduces the effects of hard water on your skin and hair by reducing up to 99% of chlorine, scale build-up and sulfur odor for a cleaner shower experience. The patented filter media bacteriostatic prevents bacteria growth and passage while eliminating other impurities that can be damaging to your hair follicles resulting in a dry and itchy scalp. Customers who`ve used this product praised the amazing adjustable 5-spray setting options for added comfort. You can choose from an invigorating pulse for relaxing muscles massage to full body spray for maximum water coverage or any of the other available options. The fact that the head can swivel and rotate either way to change settings is a plus feature for the Culligan WSH-C125. You will also be impressed by how practical and easy the installation and filter replacement is. It is a no-tool process that only requires you to wrap the included Teflon tape on the shower arm and attach the showerhead. The showerhead is a lightweight at only 1.58 pounds and the replacement filters are both affordable and easy to find. It is also compatible with WHR-140 Filter which effectively filters 10,000 gallons or lasts about 6 months, whichever comes first. Another model that has made the cut for this year`s best water softener shower heads is the elegant white Aquasana AQ-4100 Deluxe Water Filter System. Measuring 8.5 by 7.2 by 3.2, and weighing a mere 2.3 pounds, this plastic showerhead offers you a 2.5 GPM flow rate of pristine water that is better than bottled water to shower with. This filter system promises to make your hair softer and shinier, your scalp healthier and your skin remarkably softer and saturated. The Aquasana AQ-4100 is fitted with the AquaSorb HX coconut shell carbon filter which effectively filters out chlorine and enhances the smell and taste of your water. It also employs a KDF copper/zinc oxidation process that reduces the chlorine further, removes hydrogen sulfides, and other organic compounds, and balances water pH. The Aquasorb HX filters around 10,000 gallons before the need for a replacement, and that’s to say that it can last the average family up to 6 months. This showerhead stands out from the crowd with its distinctive up-flow design. This design allows the water an extended contact time with the media before it flows back up and out through the showerhead while maintaining strong pressure and without affecting the showerhead height. The up-flow prevents clogging and media channeling while maintaining upper-level filtration for an unmatched outcome. You can choose from a premium showerhead or a handheld wand and customize it with any of the multiple massage settings for the ultimate shower experience. The installation bit is super easy, requires no tools and takes less than 10 minutes. It comes with a 1-year limited warranty and 90 days guarantee. This top-rated shower filter from Berkey is an exquisite piece of art with KDF 55 granules that solve your hard water problems by effectively filtering microorganisms, hydrogen sulfide, scale, water-soluble heavy metals e.g. iron, mercury and lead while killing and inhibiting the growth of bacteria, algae, and fungi. The granules also remove up to 95% of chlorine, lime scale and mold from your shower in both hot and cold water hence reducing vapor inhalation and chemical absorption. It will typically remain effective for about 20,000 gallons or approximately one year, whichever comes first before needing a replacement. Weighing only 1.49 pounds and measuring 5*4*4 inches, this shower filter that requires no batteries to operate, is very compact and it’s designed to fit perfectly in most bathrooms. An amazing feature to note is the backflush attachment which helps prevent premature clogging. Please take note: this shower filter should never be used with a shut-off valve. It does not come with a showerhead. But the good news is that you can use your old showerhead or purchase and attach a showerhead or a handheld wand to enjoy soft, filtered water that`ll offer you a refreshing shower experience. The Captain Eco is yet another state of the art shower filter that ticks most of the boxes in regards to best features. This lightweight and easy to install filter is premium quality, chrome-plated ABS designed to offer soft, filtered shower water without limiting the pressure for an enjoyable shower. This filter’s cartridge is crafted from high-quality filtering materials and the body is exceptionally sturdy and rustproof. It includes KDF 55 granules that are high-purity copper and zinc-based compound effective in removing chlorine and water-soluble heavy metals. These granules also perform exceptionally in controlling the growth and spread of algae, bacteria, and scale in both hot and cold water. The Calcium Sulfate in this filter is by far more effective than activated carbon in removing chlorine and heavy metals present in hard water. It also has nut shell carbon filters and granulated activated carbons which help in the removal of radioactive iodine, trihalomethanes, and other impurities. The biocera ceramic balls absorb impurities that could otherwise be harmful to the skin and help with the metabolism and natural healing. The maifan balls, also included, further add profitable minerals to the water. In addition, the polypropylene cotton filter has a unique structure with a substantially bigger surface compared to ordinary filters, effective in removing rust, turbidities, sediments, and microorganisms. For those living in high sulfur areas, this filter also eliminates the bad smell from water. What`s more, you will save money with this 120% satisfaction warranted shower filter, and a full refund (including shipping) if you are not satisfied with it. To put icing on the cake, the Captain Eco shower filter comes with 2 replacement multistage high-quality cartridges and a shower curtain to make this the best water softener shower heads deal. Each cartridge lasts between 3 to 6 months or between 5,000 and 10,000 gallons of water depending on the hardness. Reports show that 85% of Americans have hard water supply in their homes. If you are among them or if you have encountered hard water while showering or taking a bath, you will agree with me that it is an annoying experience that leaves you more frustrated than refreshed. First, lathering of soap or shower gel is difficult: prompting you to use more of it, then rinsing it off especially from your hair proves a disaster. You, therefore, do not look forward to the experience because you do not get to enjoy it. Moreover, showering with hard water (loaded with minerals and water contaminants) can have damaging effects on your skin and hair making them dry and leaving your nails rather brittle. Some folks even complain of rashes outbreak and skin itchiness that’s both frustrating and unhealthy. Hard water forms scale deposits that can clog or even block the shower nozzles thereby reducing the water pressure. Hard water can be made more manageable by filtering out magnesium and calcium as well as getting rid of other contaminants that negatively affects the overall showering experience such as chlorine, trihalomethanes, and debris. As I mentioned earlier, the best water softener shower heads offer a great alternative to installing a whole-house water softening system. They come in handy in rented apartments where it might be impossible to plumb in a complex water treatment system and if you want a unit that you can travel with. As you may have realized in our best water softener shower heads reviews above, there are three major types of shower filters to choose from. The various types of heads differ in terms of design and where they are to be attached and they differ in how they affect your bathroom’s aspect. In-line Shower Filters - these do not include a showerhead and are to be installed between the water line and the existing showerhead. Since they are not bulky, they are obscure and do not affect your bathroom`s aspect as much. 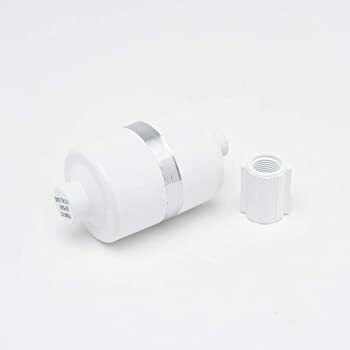 Showerhead Filter - these look just like a regular showerhead but it filters out contaminants while improving or providing a good water pressure. In-line filter and Showerhead Filter - this model has a filter cartridge contained in the in-line unit while the showerhead controls the water pressure. These are large and conspicuous and may influence bathroom aspects such as showerhead height. Showerhead filters work by removing hard water minerals (measured in grains per gallon- GPG) through a cartridge filter system. Grain rating refers to the number of grains of minerals a showerhead filter can remove before needing replacement. A simple water test will help you know how hard water the water is and how many grains it has per gallon. The essence of determining this value before hitting the market is to determine the ideal water softener shower head for your bathroom. Ideally, you want a shower head that lasts you a long time before the need to replace the filter cartridge. Generally, filter cartridges are designed to last about 10,000 gallons or 6 months before requiring replacement. The lifespan of your cartridge, however, is highly determined by the hardness of your water and the amount of water used per day. You can compare the results of your water test with how many grains of minerals your cartridge filter can remove before a replacement is needed, to determine its lifespan. Before purchasing a water softener shower head, ensure that the replacement filters are easily available (see on Amazon). Otherwise, you`d have to buy a brand new showerhead after every six months which might be quite uneconomical and unrealistic at least for most of us. On this note, know beforehand how much the replacement filters cost and their lifespan to ensure that you are getting value for your money (most of them cost about $15). This shows the amount of water the shower head will supply per minute. Most showerhead softeners can supply 2 or more gallons of softened water per minute. This is how it works: the showerhead is a small pipe section where the unconditioned water from the main supply pipe must pass through in order to be softened. When water reaches the filter pipe, the pressure drops to allow for the filtration to take place. The showerhead you choose should offer at least 2 gallons per minute; for you to be getting the recommended flow rate. Anything less than that will give you low-pressure. Technology advancement has brought a whole lots of ways of dealing with hard water and filtering impurities. The type of technology (or technologies) that a particular water softener shower head employs determines what it is capable of dealing with. And that’s to say that there’s need to peruse the spec sheet to find out whether or not your target model will solve your problems. Multi-level carbon filters - The multi-level carbon filters use cartridges that push the water through 10 – 12 different mediums each filtering different pollutants. They eliminate bacteria, pesticides, heavy metals and chlorine among other pollutants. Carbon filters inhibit the spread and growth of mold and fungi together with lime/scale development thereby promoting the lifespan of your showerhead. This is the most accepted method of filtration in showerheads and it is similar to ones used in other water filtering and softening systems. KDF (Kinetic Degradation Fluxion) filter - this filter makes the best water softener shower heads for municipal water. This is a highly effective filter composed of high purity copper and zinc granules capable of eliminating viruses and bacteria, together with chlorine, water soluble metals, hydrogen sulfides (the awful odor of rotten eggs) and other inorganic compounds. KDF filters also help in balancing the water pH and can be used alone or together with carbon filters giving you highly filtered and soft water. Vitamin C filter- Vitamin C filters are best advertised for their ability to improve your skin`s overall aspect, making it feel soft and moisturized after a shower. The filters are also good at removing chlorine and chloramines from water although not so effective at removing the other contaminants found in water. To counter this, they can be used together with KDF or carbon filters. City water is often treated with chlorine and chloramines to kill bacteria and viruses but can cause dry hair and itchy skin. Sometimes, water can have a foul odor like that of rotten eggs from high levels of hydrogen sulfides. Well water, on the other hand, can cause black stains from manganese or orange ones from iron (see tips on how to remove hard water stains). When buying a water softening showerhead, choose one that can eliminate these and other effects of hard, unconditioned water that is supplied to your home. It will not hurt to read about other people`s experiences with the product you are about to spend your money on. Apart from manufactures claims, read what other people who have used the product say concerning its practicality and about various other products so you can make an informed decision in the end. Before purchasing any of the above filters, read about their installation process. Ideally, you want a head that installs easily more so without the need for any tools. On the same note, if you are considering an in-line shower filter, it’s important to go with a model with a universal design. Such models are designed to be compatible with most shower heads and don’t require additional fittings. Is a water softener shower head economical? Well, a water softener for the shower is much cheaper if you were to compare its upfront cost to that of a whole-house water filtration system. It is also much cheaper to install in that it does not require to be plumbed in. Neither will it require professional installation. There is an obvious twist to these units though: they only protect your showerhead while leaving your pipes, faucets, and appliances including your washing machine at the mercies of hard water. So, unless you are buying the showerhead for temporal use, for instance, in a dorm installing a whole-house water softening system is the most economical option at the end of the day. Do water softener shower heads soften water? Yes, they do although the performance may vary from one model to the other depending on the complexity of the softening system. Generally, these units have a few ounces of resin beads (that are responsible for trapping calcium and magnesium ions). That’s to say that you can’t compare their performance to that of full water softening systems that boast a tankful of resins. All in all, the best water softener shower heads work like charm in making the water manageable and your general feel after the shower. This is because they remove most of the chlorine and other contaminants thereby making the water less harsh on your skin and hair and easy to lather with soap and rinse off. Do water softener shower heads affect the water pressure? This depends with the model. The best water softener shower heads are crafted with this aspect in mind and boast flow rates of 2.5 gallons per minute which is the federally mandated rate for showers. A model that is rated at 2.0 gallons per minute isn’t so bad too and you won’t actually feel a significant difference. Anything below this, however, can have a dramatic effect on your showering experience especially if you live in extremely hard water areas. The best water softener shower head can start your day with a clean and revitalizing shower and get your skin and hair feeling great throughout the day. The key advantage to a shower-specific water softener is that it is much less expensive to purchase and install compared to a whole house water softening system. However, keep in mind that these units might end up being costly especially if you have to purchase a head for several showers. Worth mentioning is that while a shower-only softener is a cheaper alternative to a whole-house water softening system, it does not protect you’re the rest of your plumbing and fittings from the potential damage that hard water causes. So, unless you are looking for water softener shower head for temporal use, installing one of the best whole-house water filter might be economical down the road.